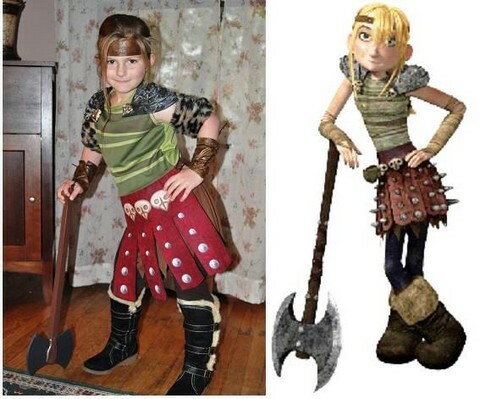 This year, we've received a huge number of photo submissions for our Halloween album and we're awed by the creativity and variety of these Mighty Girls' amazing costumes. 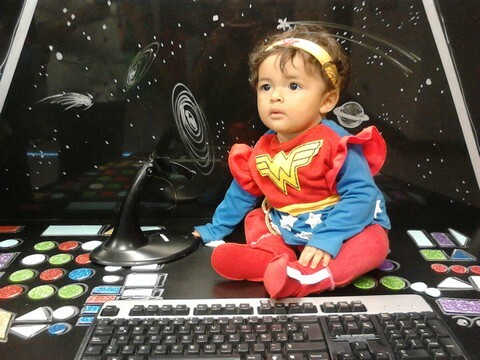 As we've always said, Mighty Girls know that their costume possibilities are limited only by their imaginations and, with costumes ranging from ones based on favorite superheroes to ones inspired by historic role models, these Mighty Girls clearly know no bounds! 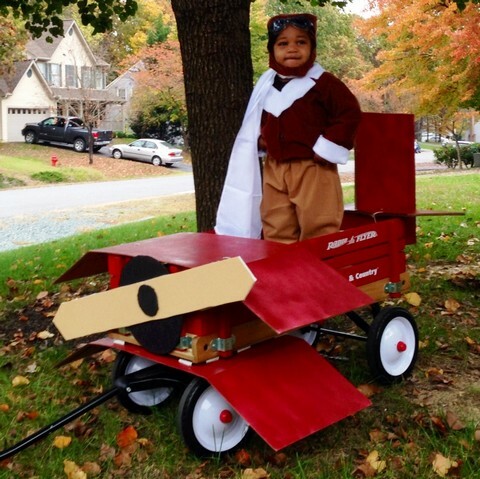 In this post, we've showcased a small sample of these incredible costumes -- to browse the over 700 photos submitted, visit the 2013 A Mighty Girl Halloween Album. And, to help you and your Mighty Girl learn more about the wonderful characters and historic figures depicted, we've also linked to our character collection and biography section where relevant. 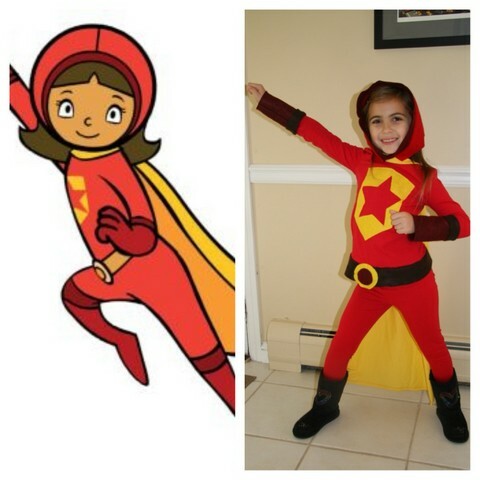 If you missed our earlier post highlighting creative Mighty Girl costumes from 2012, check out our blog post, A Mighty Girl Halloween: 50 Mighty Girls in Costume. 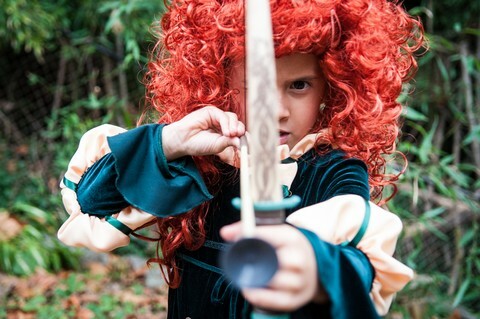 And, if you're seeking girl-empowering dress-up clothing or costumes anytime of year, visit our extensive costume collection with options for all ages from infants through adults in A Mighty Girl's Halloween Costume Guide. You can also find Mighty Girl stories for many of the upcoming holidays, including Thanksgiving, Hanukkah, and Christmas, in our Holidays & Celebrations collection. 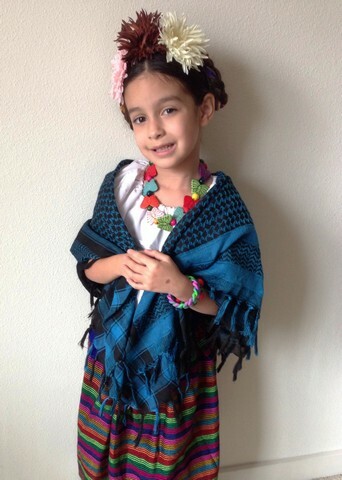 Our daughter dressed as her favorite artist, Frida Kahlo. 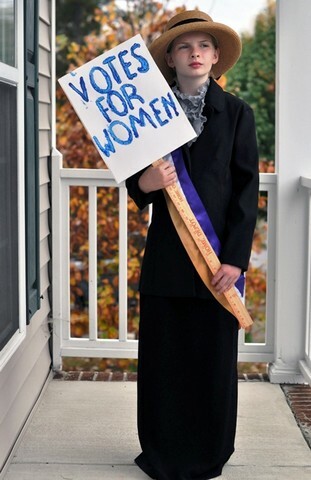 This is my 11 year old daughter, Allie, dressed up like her hero, Alice Paul. Allie put the costume together herself with clothes found at various thrift stores and the sash she bought (with her own money!) at the centennial suffrage march this past spring in Washington, DC. 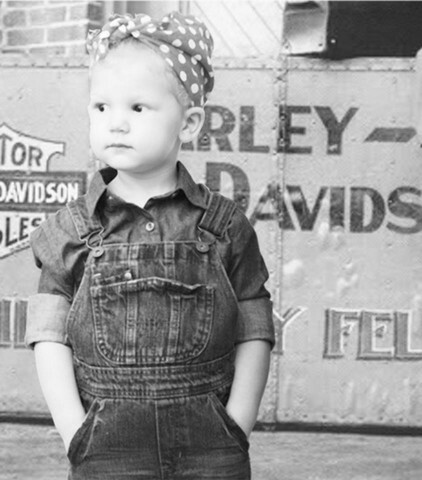 My 2 year old Michelle refused to do the iconic pose of Rosie the Riveter, so my husband gave her a Harley background instead. Either way, she had a blast! 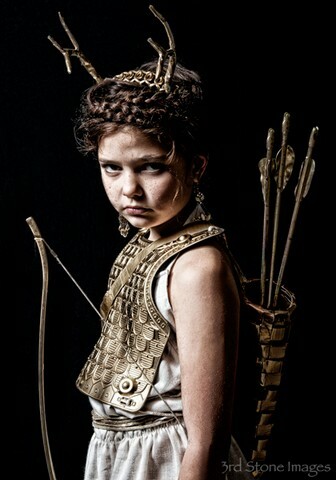 Artemis, Greek Goddess of the hunt, wild animals, and women's rights! 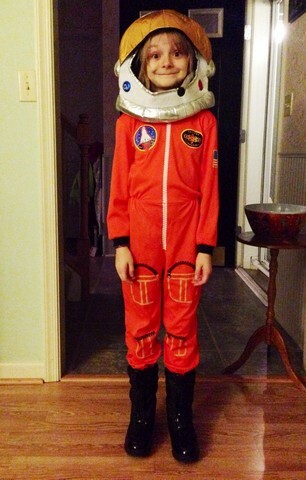 This is Erin, age 8, who chose to be an astronaut for Halloween this year. She was inspired after a visit to the Smithsonian Air & Space Museum last summer. 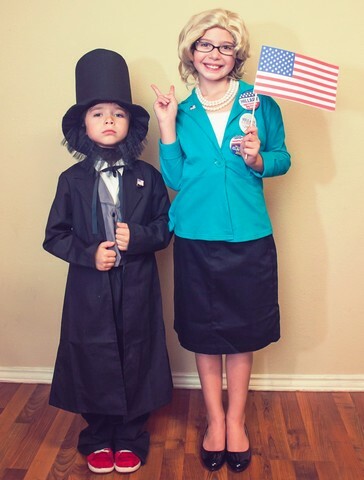 Who says a presidential theme has to be for boys only?! 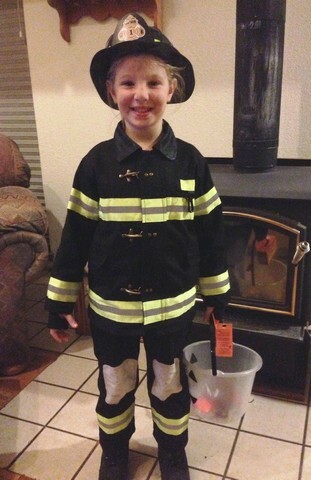 Haley wants to be a firefighter when she grows up! 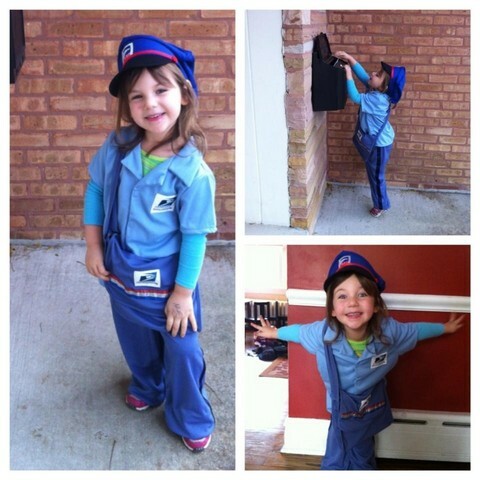 Meet Romy, our 4 1/2 year old mail carrier, who was inspired by our actual female mail carrier and Romy's own love for making and delivering notes to friends! Great moment for both of them when we they saw each other while trick or treating! 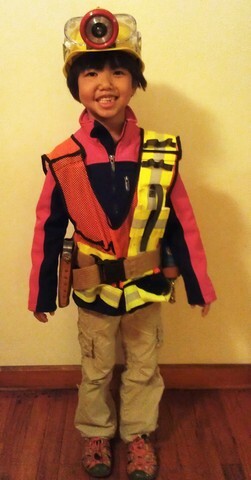 Katie (age 6) has been a construction worker for Halloween three years in a row. She loves to build. When she grows up she wants to be a construction worker, a race car driver, and a pilot. 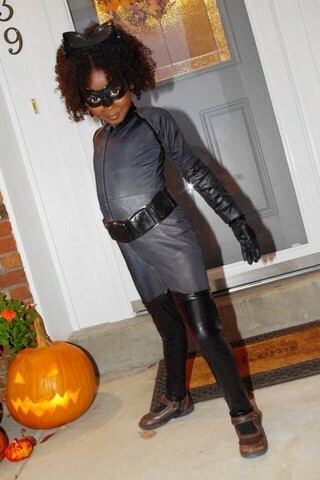 Janelle, 11 years old (halloween 2013), as Hydra, this was her cold weather costume. 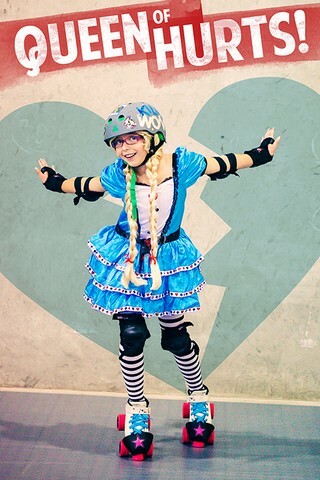 My daughter is part of the Texas Rollergirls Junior League. This was her derby costume this year! The Queen of Hurts! 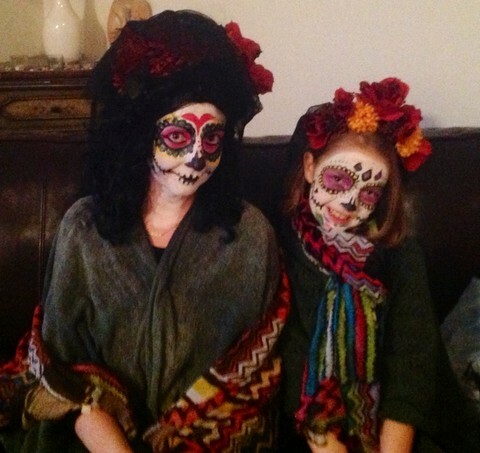 My mighty girl Emma, 9, and me, dressed for Dia de Los Muertos. We were inspired by Frida Kahlo. 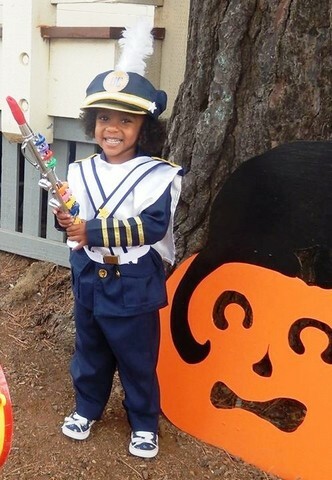 My 2.5 year old mighty girl loves the CAL Berkeley Marching Band and asked me to make this costume for her. 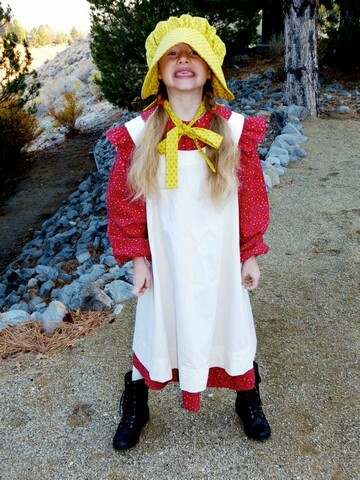 Our daughter Scout dressed up as herself this year. 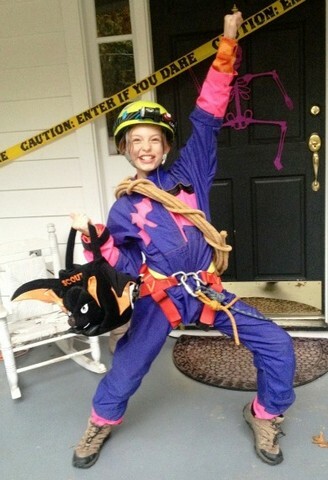 She has been an active cave explorer, "caver" her whole life, so pulling the gear out of her closet was easy! My daughter Evie loves insects and especially rescuing insects in need. She wanted to be Queen of the Insects this Halloween. 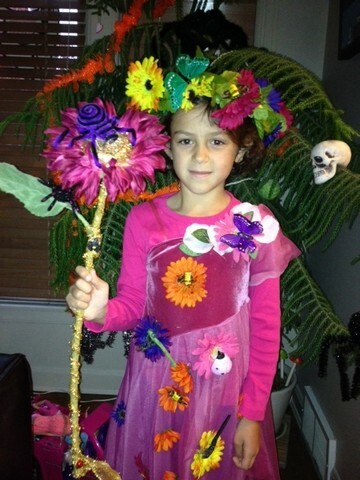 My seven year old as the Fiction Fairy! 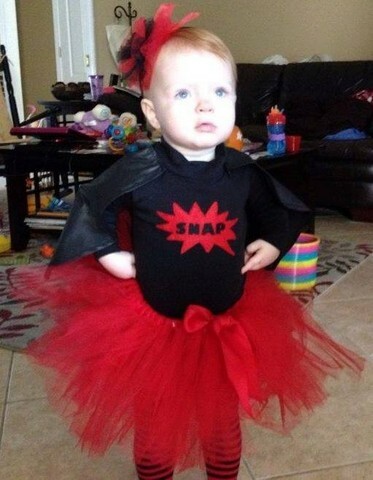 My little red head (Vivi, 17 months) is her own superhero - Ginger Snap! 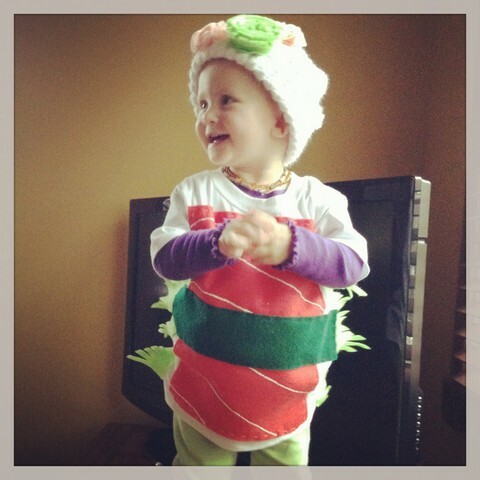 Sadie Lu (15 months) ready for some Halloween fun in her tuna sashimi costume. 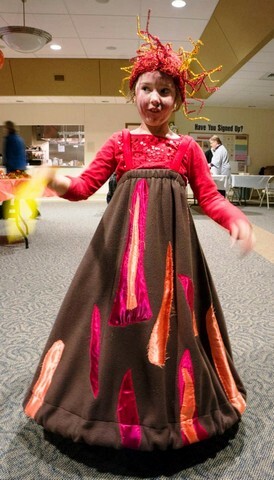 My daughter Ellie, 5, dressed as an erupting volcano. She loves Earth science and has a volcano calendar in her room. 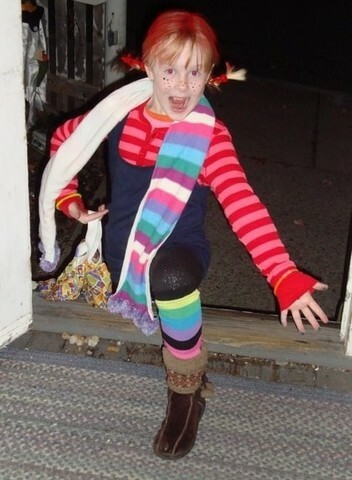 My mom made this costume with a hula hoop at the bottom, and I made the knitted hat with metallic pipe cleaners. 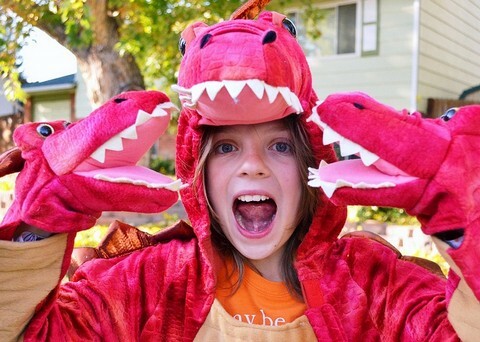 Ellie does a fun "explosion" in this costume that starts with her stomping her feet (tremors) and ends with her jumping around as the volcano erupts! We call Tessa a "racing snail" because she can crawl like the wind! 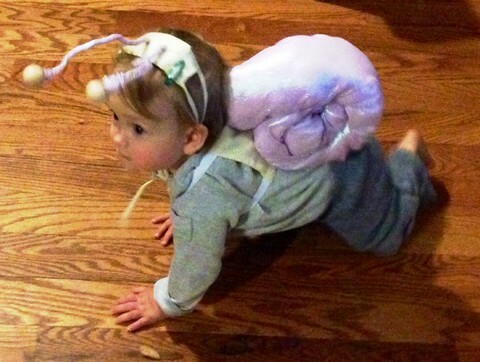 More recently, she upgraded to being an "all-terrain racing snail," as there is no obstacle in her path that she won't climb over to get where she wants to go. 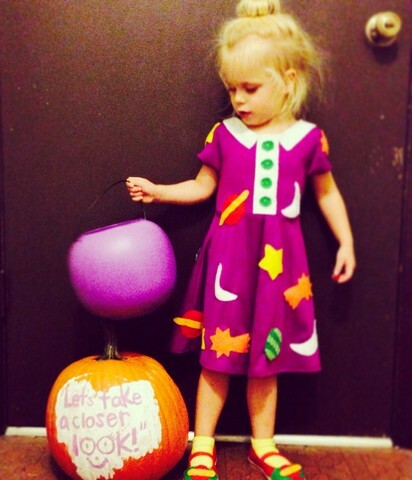 My daughter announced that she'd chosen to be Ms. Frizzle (the amazing teacher from The Magic School Bus) for Halloween several weeks ago. I was thrilled! So I got to work on her costume and shoes. She asked about her Ms. Frizzle daily. Here she is: Tiny Friz! Meg (4) insisted she needed to be Wonder Woman because they're both "big, brave, and strong." Pippi Longstocking, strong enough to carry a horse up the stairs of Villa Villekula! 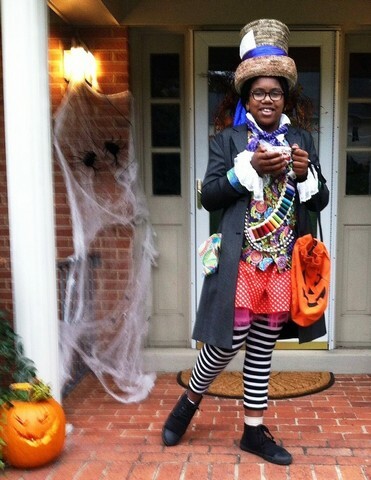 The Mad Hatter is perfect for middle school because everyone there is mad as a hatter, she said! 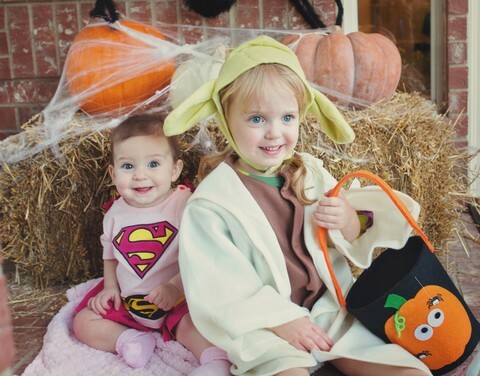 Happy Halloween from Yoda and Super Baby! Word up, it's Word Girl! Seven-year-old Anya absolutely adores Word Girl - and who can blame her? 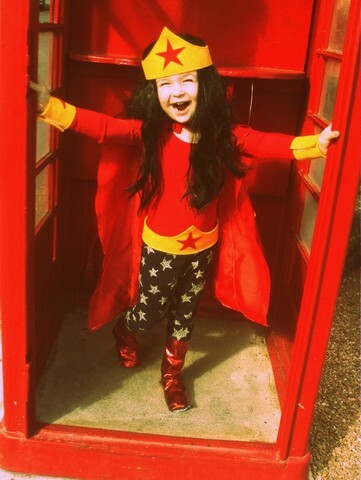 A superhero who both stops crime AND improves her vocabulary? 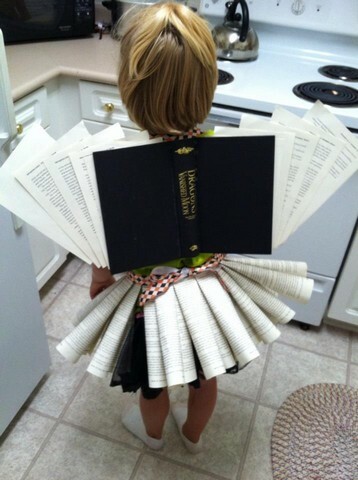 Perfect for my book-a-holic. 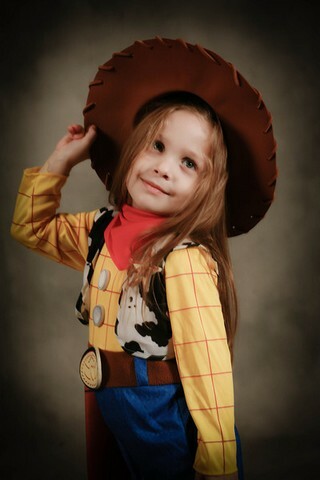 I couldn't find a costume available to purchase, so even though I don't really know how to sew, I managed to put this one together for her, and her smile when she put it on made the work completely worth it. May the force be with you - Gillian is a mighty girl from head to toe. 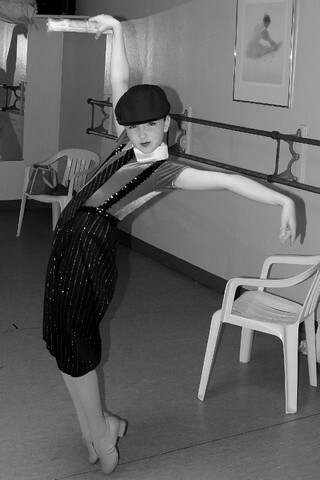 My Mighty Girl was a Newsie for Halloween this year! 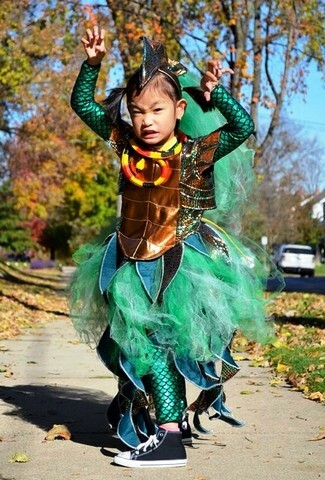 She wore this costume in her tap recital last Spring and had to wear it again for Halloween, she loved it so much! Now she is asking to see the musical! 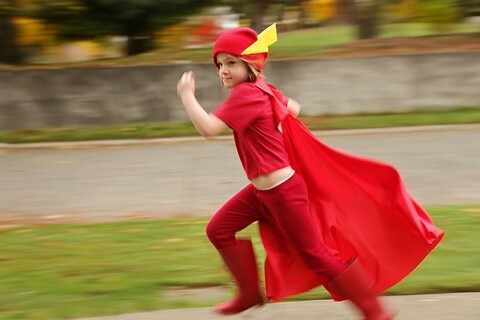 My 5 year old daughter as the flash. We chose this as a theme after she was told she was one of the fastest kids in her PE class. 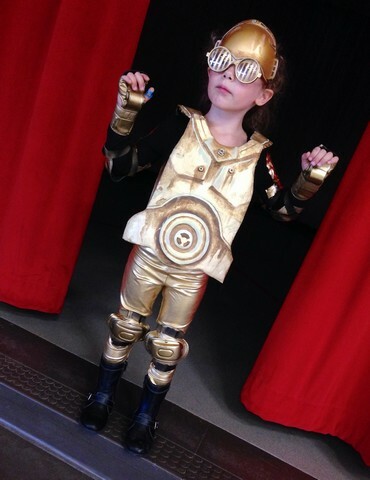 My daughter's favorite character is C3PO. 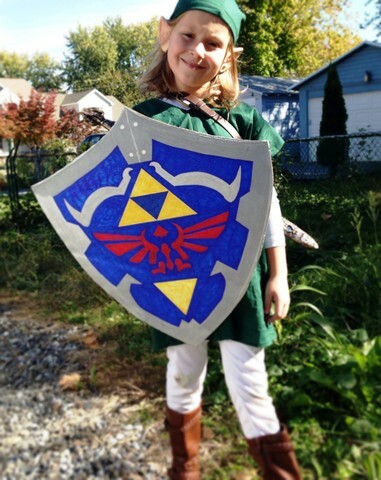 For Halloween that's the first thing she asked to be. Since the store bought ones were goofy, I made this one from cardboard and paper clay. She loves it! 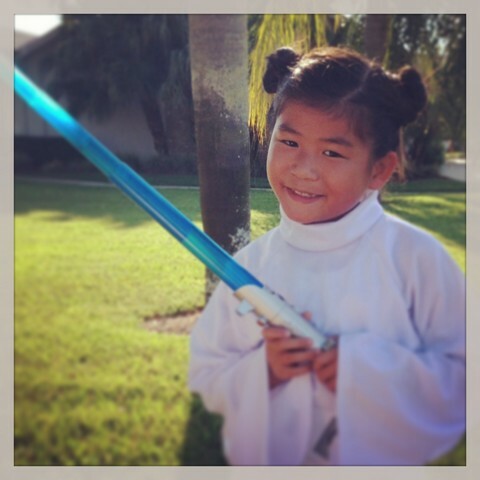 Maile (6) wasn't sure her friends at school would think her costume choice was "girlie" enough. 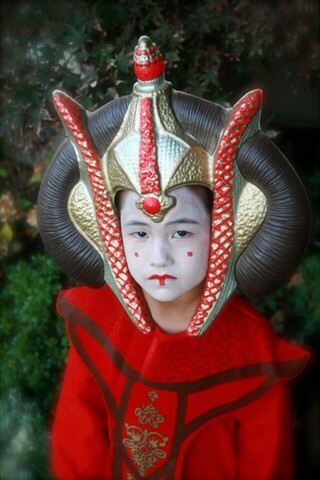 Her brother reassured her by saying, "Queen Amidala rules a planet. She's kind of a BIG DEAL." My daughter was enthralled over discovering Dr. Who on BBC this summer. 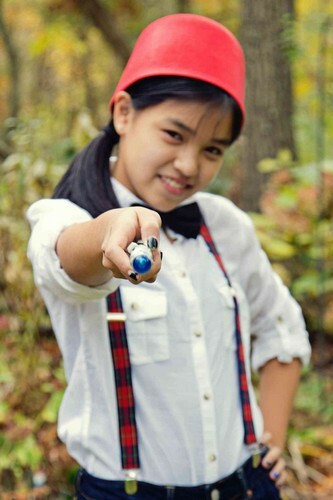 Her outfit is her own design, complete with bowtie, fez and, of course, a sonic screwdriver. Alize, salvando el universo ella solita. My Mighty Girl has been reading the Little House series; plus, we visited the Ingalls' Homestead this year on our family road trip. 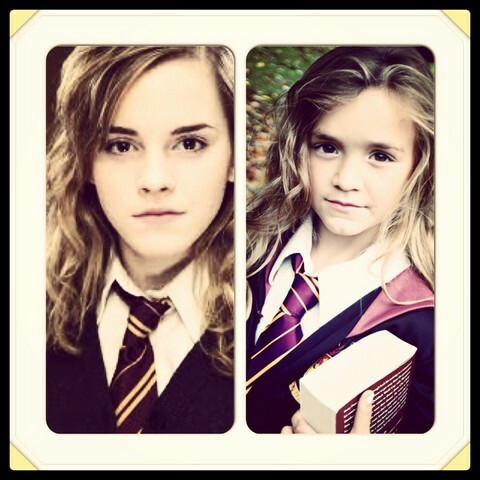 Of course, she wanted to be her favorite character for Halloween. Surprisingly, not very many people knew who she was! 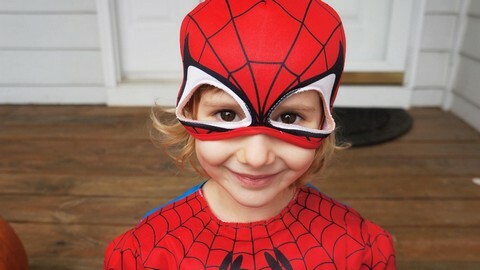 This little Web Slinger wears this costume not only for trick or treating, but also to go grocery shopping, visiting the grandparents, and any other occasion where she's out in public and someone might need saved! Nahlia, 3 year old mighty girl, wanted to be "Snake Eyes" from GI Joe. 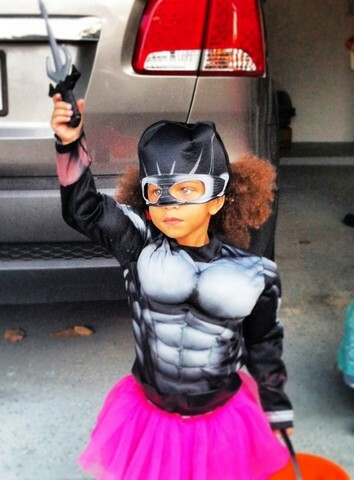 At the last minute she added a pink tutu and told everyone she is a "strong ninja ballerina"! We are so proud of this mighty girl! Gracie 3 years old, is my mighty girl. She battles Cystic Fibrosis everyday and doesn't let it slow her down. 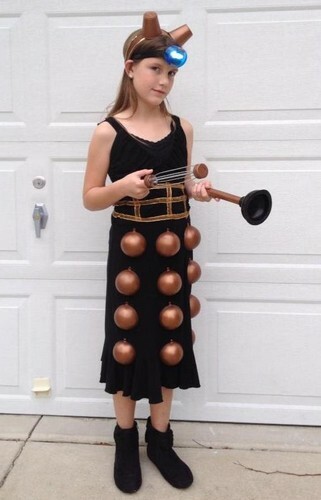 Chloe, 10, chose to be a Dalek from Doctor Who, and helped make the costume from thrift store and craft shop items. After years of elaborate costumes, sometimes it's easier to just choose a character who you're a lot alike...and nail it! My daughter loves the Percy Jackson books and just finished reading the last book of the following series, House of Hades. 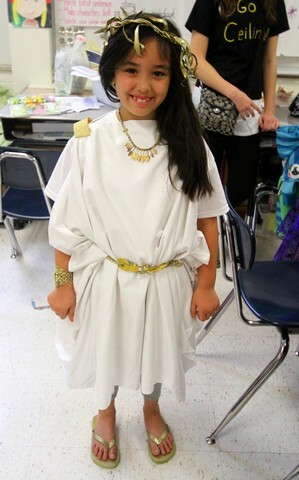 She chose to be the Greek goddess Hecate from the book. This is my daughter Meredith as Thor. Meredith likes the Thor comics to be read to her at night before bed. One night we read about Odin banishing Thor to earth and to 'humble' him he turned Thor into a woman. This didn't make any sense to Meredith and after the story she said, 'Mommy, I think Odin turned Thor into a woman to make him stronger.' 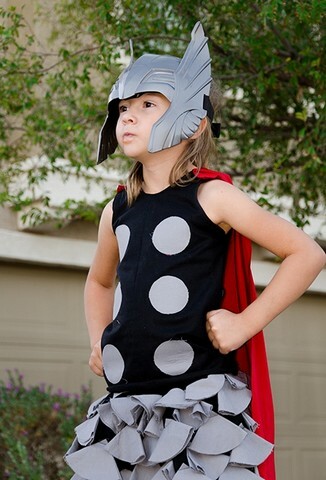 Afterwards, she asked me to make her a Thor costume. Her favorite part of it is her shiny red cape. 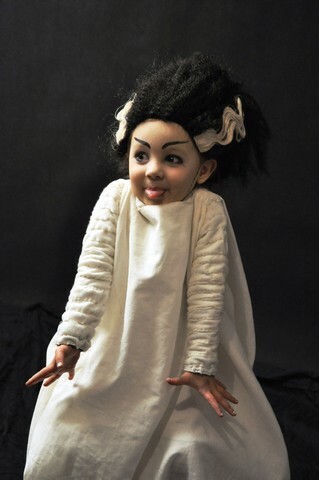 My 3-year-old Mighty Girl, Amelia, as the Bride of Frankenstein (or "Frankie", as she calls her). 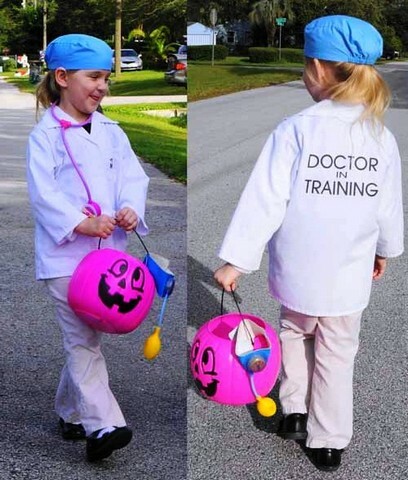 She even convinced her Grandma to go as Dr. Frankenstein. 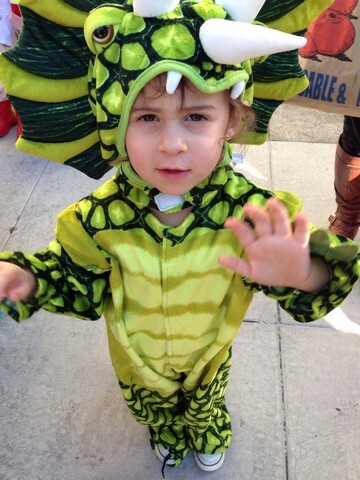 She says next year she will go as the Monster.